Ryan L. Graeme, a senior at Coe-Brown Northwood Academy, was recently presented with the CBNA’s highest agricultural honor, the DEKALB Agricultural Accomplishment Award, sponsored by the Monsanto Company. 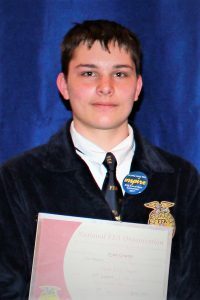 Graeme, the son of Rebecca Gowitzke of Northwood, received the award for excellence in academics, leadership and agricultural work experience. Some of Graeme’s significant experiences and accomplishments have included National Bronze Placing Horse Evaluation Team, Chapter Vice-President, and award winning Forestry team for three years at CBNA. Mr. Graeme is under the supervision of Sarah Ward and Charles Whitten, agricultural education instructors at CBNA. This year the, the DEKALB Agricultural Accomplishment Award celebrates its 70th anniversary. Over these 70 years, more than 168,000 high school seniors from across the country have received the Award, which has become a symbol for excellence in agricultural education. As the 2017 winner of this award, Graeme’s name will be recorded on a permanent plaque displayed at Coe-Brown.